To Cite: Farajzadeh Jalali Y, Nasiri M, Jabbari F. Analyzing Facial Esthetic and Divine Proportion From Orthodontics Perspective, Iran J Ortho. 2015 ; 10(1):e4928. doi: 10.17795/ijo-4928. Background: Achieving esthetics is the most important objective of the modern orthodontics. The introduction of a standard, called the divine proportion for the evaluation of a profile, can lead orthodontic, orthopedic and surgical treatment to obtain maximum facial beauty. Objectives: The aim of this study is to analyze the divine proportion in the face of Iranian normal females and the ability of that using as a standard and index to analyze harmony in patient’s face before and after orthodontic treatment along with other common cephalometric analyses. Patients and Methods: The selected samples included twenty 19 - 26 years old females. Full-face and profile photography and lateral cephalometric radiography were taken; initially the cephalometric radiography were used for conducting common cephalometric analyses in order to compare them with the results gained from the divine proportion measurements. Seven ratios in photography and twelve ratios in radiography calculated. Radiographic and photographic data were analyzed separately using multivariate analysis of variance (MANOVA) and one-sample t-test and compared with 1.618 (golden ratio). Results: The average values vary from 1.4 to 1.7; the ratio R11 with the average value of 1.613 was the closest value to 1.618. Three cephalometric variables (R3, R8, R12) and two photographic ones (R6 and R7) had a significant difference with 1.618. Conclusions: The divine proportion on the soft ratio can be a good standard to assess an orthodontic treatment. Divine proportion covers a wide domain and there is a long way ahead of these studies; so it can be extended even more in future. Orthodontics is in relation to the form and appearance of the face. Angle in 1907 suggested that there is an inseparable relationship between studying orthodontics and studying art when one considers human’s face. Angle believed that the facial beauty depends also on the position of upper incisors, what has been demonstrated today by Holdway analysis (1). Tweed in 1944, put a certain importance on esthetic at the time studies were mostly concentrated on the hard tissues. Subtelny in 1959 showed that the relationship between the hard and soft tissues is not completely linear. He measured both vertical and horizontal relations of face and figured out that all parts of the soft tissue’s profile do not necessarily follow the lower skeleton (2). So over the time, the goal of orthodontics changes from establishment of the ideal relation between maxillary and mandibular teeth to establishment of the ideal relation between maxillary and mandibular teeth coincide with maintaining or improvement of facial beauty (1, 2). A definition of the word beauty is “the quality which makes an object seem pleasing or satisfying in a certain way” (3). Perception of facial beauty has genetic, environmental, and cultural foundations. In the most pure way, Euclid defined a harmonious proportion derived from the simple division of a line into what he called “its extreme and mean ratio”. In Euclid’s own words, “a straight line is said to have been cut in extreme and mean ratio when, as the whole line is to the greater segment, so is the greater to the lesser”. This ratio was defined by Euclid as the golden ratio. Interestingly, this ratio represents a never-ending number 1.68033 (4, 5). Divine proportion is said to be an important feature that is found in many beautiful works of art, architectural structures, and objects designed for human use and the most of what is found in nature. This proportion has been discussed in various parts of human body, face and teeth (6-9). 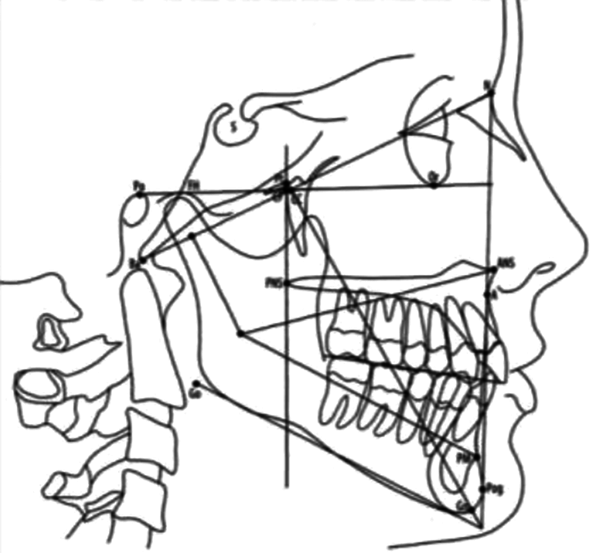 Although angles and linear measurements in cephalometry are very helpful guides to determine orthodontics and surgery treatments, the divine proportion is another method that can help the dentist to find areas which have the most harmony and balance and hence is the best way to achieve a harmony in esthetics and mostly lead to adaptability and functional efficiency (10). In 1984, Ricketts reported about a significant number of golden proportions when analyzing the facial skeleton and overlying soft tissue. He was strong advocate of the use of these divine proportions as a guide for planning the correction of dentofacial deformities via orthognathic surgery (11-13). Marquardt, who developed a beauty mask based on the divine proportion, showed that regardless of race or age, a face is deemed beautiful if it conforms to this beauty mask (14). The wonderful results of Ricketts convinced us to analyze his variables among our population, because we can use them in the orthodontic treatments only when they are the case in the Iranian race and in this condition we can even use orthognathic surgery to reach normality, harmony and beauty, which are among the goals of orthodontic treatments. The aim of this study is to analyze the divine proportion in the face of Iranian normal girls and the ability of that using as a standard and index to analyze harmony in patients’ face before and after orthodontic treatment along with other common cephalometric analyses. Twenty female with a normal full face and profile views between the age of 19 and 26 years were invited to participate in this investigation. The most of the participants was recruited from medical, dental and nursery schools of Medical Sciences University of Shiraz. The participants were informed on the characteristics of the study and agreed to participate by signing an informed consent form. In the first part of the investigation the subjects standardized full-face and profile photographs and also lateral cephalometric radiography was taken. The subject’s heads were oriented in the natural head position, and a standardized photographs and radiographs of each subject were taken by the same operator. In the second part of this study and in order to evaluate the divine proportion in subjects face, their necessary measurements were taken. Measurements of soft tissue were made only on the full-face photographs, because for analyzing the profile photographs we needed the tragus of ear, which was unavailable because of wearing scarf. Moreover, in full-face photographs it was difficult to determine the exact location of trichion and made our measurement problematic; thus the relevant measurements were ignored. Lateral cephalometric radiographies were used for conducting common cephalometric analyses in order to compare them with the results gained from the divine proportion measurements. 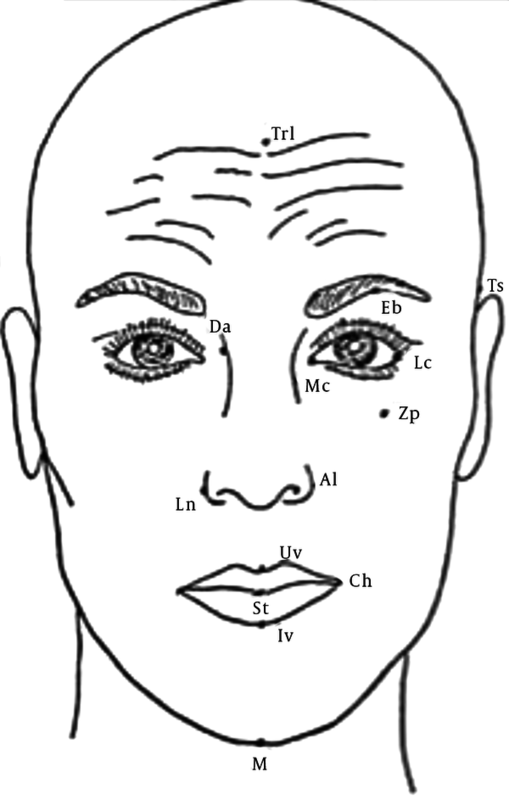 Normal measurements, which were performed on the cephalometry: facial angle, angle of convexity, Y-axis, SNA, SNB, ANB, IMPA, inter incisal angle, U1 to SN, Wits appraisal and Jarabak index. Ricketts has measured these proportions through working with his computer composite samples, which were a combination of normal samples; and he has measured them with the golden divider. However, since we had not access to the mentioned tools, we used manual measurement method for all tracings. Radiographic and photographic data was analyzed using multivariate (ANOVA) and one-sample t-test and compared with 1.618 (golden ratio). Descriptive results of statistical analysis of cephalometric and photographic data are indicated in Tables 1 and 2. The average values vary from 1.4 to 1.7; the ratio R11 with the average value of 1.613 was the closest value to divine proportion. The P-value of less than 0.005 is shown a significant difference with value 1.618. Therefore, Wits apprasial, for cephalometric variables, three items ( R3, R8, and R12) and two items (R6 and R7) in photographic variables had a significant difference with 1.618. As photographic findings showed, all vertical ratios were compatible with the divine proportions. These ratios were: nose bottom: mouth; nose bottom: chin; nose flair: nose bottom; eyebrow top: eye top; mouth: chin. Achieving esthetics is the most important objective of the modern orthodontics; thus, analyzing the divine proportion on the soft ratio can be a good standard to assess an orthodontic treatment, because in many cases analyzing the hard tissue may reflect some deviations from the normal form, but it has been covered with the soft tissue (15, 16). The age group of subjects in this study was 19 to 26 years, whose growth age has been almost completed, because as we know the adolescence and puberty time would be associated with many changes in the facial proportion, especially in nose and lower jaw. Only female subjects were selected to limit the scope of the variables in the study and also decreased the dilution of results. In this study measurements of soft tissue were made only on the full-face photos, because for analyzing the profile photographs we needed the tragus of ear, which was unavailable because of wearing scarf. Moreover, in full-face photographs it was difficult to determine the exact location of trichion and made our measurement problematic; thus the relevant measurements were ignored. Barrer and Ghafari, and Rupesh et al. used silhouettes for evaluating the divine proportion in profiles because this eliminated all extrinsic and intrinsic distracting variables such as hairstyle, make-up, skin complexion (17, 18). Result of this study showed that the divine proportion was established in the most analyzed cases, certainly the error probability in measuring and finding points must be considered. Thus, few millimeter of difference can bring about considerable alteration in the gained ratios. Any mistake in finding the exact location of cephalometric points can make us far from the divine proportions. The ratio R11: A-Pm: FH-A with the average value of 1.613 was the closest value to divine proportion. This is in agreement with Ricketts who observed thirteen divine proportions in the lateral cephalometry (10). This is in contrast with the study by Jahanbin et al. in an Iranian population, who reported none of the proportions had the mean of 1.618 (19). Three cephalometric radiography variables among R3, R8 and R12 and for two photography variables among R6 and R7 had a significant difference with 1.618. Not only soft tissue ratios, but also hard tissue ratios are important. For example, the body-ramus of mandible was a golden ratio in Ricketts’ all samples and it was established in our findings, as well and it did not change with increasing the age of samples. Therefore, it can be used for determining the dysplasia of the mandible and or in orthognatic surgeries for determining the proper length of body and ramus. The divine proportion on the soft ratio can be a good standard to assess an orthodontic treatment. Divine proportion covers a wide domain and there is a long way ahead of these studies; so it can be extended even more in future. In this study, only females and lateral cephalometry were considered; whereas it can be performed on boys with frontal cephalometry and more profile photos and the wonderful value of 1.618 not only in theory, but also in practice can be used. The authors wish to thank Professor Allahyar Geramy for his guide and help in preparing this manuscript.